Sunday, May 7, at 4 o’clock, the Ann Arbor Symphony played its final concert of the season at Hill Auditorium. It was one of their finest concerts! The music was magical. It just carried me away. Arie Lipsky is a wonderful conductor. He knows how to bring the best out of every musician. It doesn’t matter what instrument he or she plays. He seems to know how to reach into each one’s soul and ignite that magic spark. The program opened with the Overture to William Tell and the Overture to Semiramide by Gioacchino Rossini. This was followed by the Opera Choruses by Giuseppe Verdi. 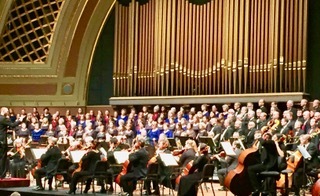 The choruses were sung by the Carillon Women’s Chorale, the Livingston County Chorale, the Livingston County Chorale Women’s Chorus and Measure for Measure, the men’s choir of Ann Arbor. The acoustics at Hill Auditorium are perfect. You can hear every note that is played or sung no matter where you are sitting. It was an excellent choice for the performance. The stage is very wide and goes completely across the front of the auditorium. It is a thrilling sight to see the entire orchestra sitting there and then to watch the four choruses file in and stand on the risers behind them. The womens’ choruses filed in from the left while the men’s filed in from the right. It was a splendid sight once everyone was in place. The choruses sang while the orchestra played. The selections were: The Anvil Chorus from Il trovatore, the Gypsy Chorus and the Matador Chorus from La traviata, Chorus of the Hebrew Slaves from Nabucco and the Triumphal March from Aida. After the intermission, the orchestra played Capriccio Italien, Op. 45 from Tchaikovsky and The Pines of Rome by Ottorino Respighi. The music was enchanting and the moment seemed to go on forever and then it stopped. The applause was exuberant, heartfelt and passionate. Everyone felt they had experienced something extraordinarily wonderful! Claire, you’ve described your musical experience with beautiful clarity. I wish I had been there. Thanks! I think you would have enjoyed it. It was magical. May 7 was Mother’s Day. Thanks, Kook-Wha. I’m glad you enjoyed it. Thanks, Phil. I’m happy you enjoyed it.